Chinook fishing at Richmond Beach near the Oil Docks. The area ear the Edmonds Oil Docks and Richmond Beach can be a great place to fish for Chinook Salmon in Puget Sound. Especially during summer months, this area always has a few Chinook Salmon swimming around. I usually have no problem marking herring schools on my sonar and know that once I find the bait, I usually have a good shot at catching a salmon. Where is Richmond Beach and the Oil Docks? The Edmonds Oil Docks are about 2.5 nautical miles South of the Edmonds Marina. Richmond Beach is a small community just south of the Oil Docks. 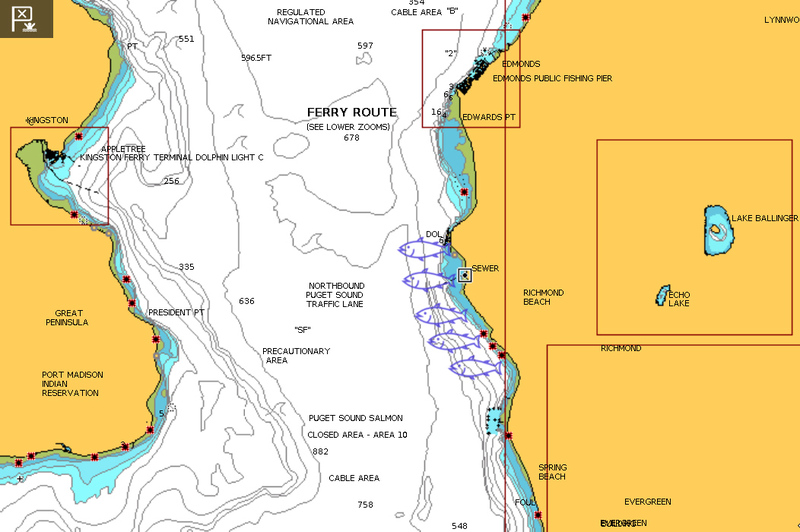 This area is about 5 nautical miles North of Shilshole Marina and Boat Launch. Both spots are in Marine Area 10. Salmon fishing can be great in this area. Close to Shilshole Bay Marina and Edmonds Marina. Chart courtesy Navionics. The most popular fishing spot for Chinook Salmon is right in front of the Oil Docks. It is a prominent structure and you can’t miss it. It is fairly deep right in front of the Oil Docks (about 100 feet). You can also troll around the Richmond Beach area and pick up fish. Basically, there is a steep shelf where the tide concentrates the bait. This is where you want to fish. I have had good luck fishing on both sides of the tide. On an incoming tide I will start at the Oil Docks and troll South towards Richmond Beach. On an outgoing tide I will do the opposite. My favorite way to fish here is trolling with downriggers. Early in the morning before first light the Chinook can be suspended at 50′ to 70′ but I typically fish my gear right off the bottom in 100′ to 130′. As long as you are marking bait here and there you are in the right spot. The Richmond Beach area can be good for Coho Salmon fishing later in the summer. There is a yellow weather monitoring buoy south of Richmond Beach and I like to troll the tide rips nearby. This area can be really grassy so check your gear often. 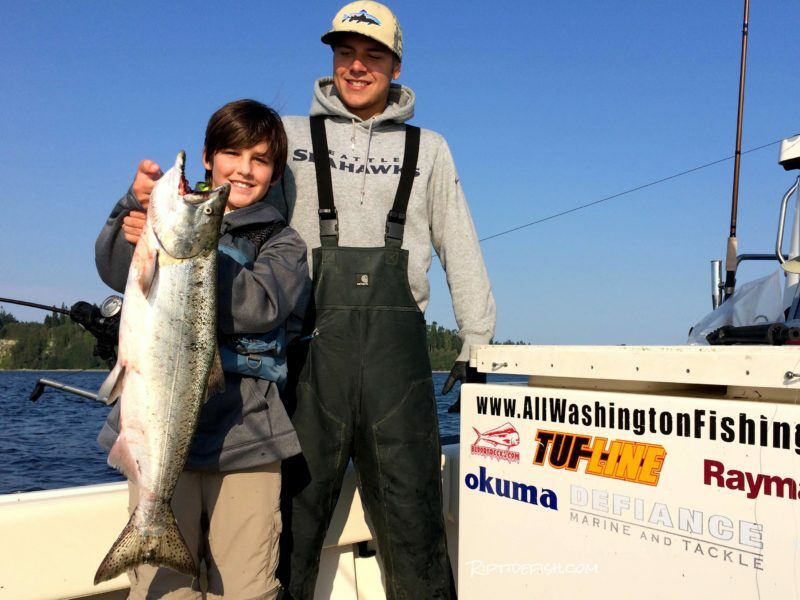 To explore other great fishing spots check out my post Puget Sound Chinook Salmon Fishing Hot Spots.